If you’re into gaming or have kids, you’ve probably heard about Skylanders. It burst onto the scene in 2011 and is now making the jump from console to mobile. 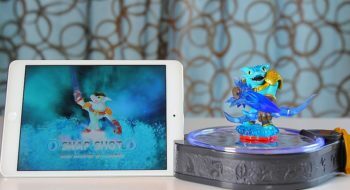 Lets’s take a look at Activisions Skylanders Trap Team for the iPad. Trap Team is the latest instalment in the Skylanders series. If you’re not familiar with Skylanders, just a very quick introduction — it’s a role-playing action adventure game where you switch out your on screen characters by placing character figures on the portal of power. These figures are purchased separately for upwards of 15 dollars depending where you live. In Trap Team you use special traps – again, which you can buy separately – to capture defeated enemies which you can then play as whenever you want. Now before I go any further, I want to make this very clear, this isn’t a watered down version of Skylanders. This is the exact game you would be playing on your console. Because of this, it is only currently available on the iPad when it comes to iOS — and only certain iPads. Before you rush out to buy this game, make sure the iPad you have is compatible with the game. When you’re installing it, you’ll have the option of a full install which is around 6 GB’s in size or a smaller “lite” version. Lets talk about what you get with the iPad version of Trap Team. Much like the console version you will get the portal base which connects to your device over bluetooth. Yes, it runs on batteries, so if you’re planning a really long gaming session, have some extra batteries on hand. You also get a couple of Skylanders characters Snap Shot and Food Fight. 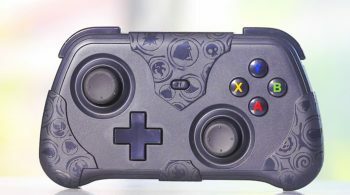 But what’s unique to the iOS starter pack of Trap Team, is you get a wireless controller. 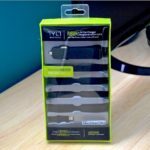 Again, it runs on batteries and connected to your device over bluetooth. This isn’t some cheap feeling controller either. It fits nicely in the hand and the buttons are very responsive. And don’t worry about losing connection with the game while in a heated battle, you can of course play without it. The game offers touch screen controls. The gameplay is very straight forward, you walk around the game battling enemies, picking up treasures, levelling up and buying upgrades for your characters. The storyline will guide you through the game as well. Each Skylander will have its own unique attributes, and will represent one of the many elements. Having different characters that represent the different elements will allow you to open new areas in the game. Yes, that’s right, if you’re looking to unlock everything in the game and complete it 100% you’re going to have to spend some extra money — and it can get quite expensive. You’ll need extra traps and extra characters of different elements. You can enjoy the game with what you get in the starter pack, and you don’t have to trap the enemies if you don’t want to. But who wants to play just part of a game? This is where Activision gets you. To be fair, the character figures are very detailed and look really cool. They can be displayed, and as long as you or your kids aren’t too rough with them, they can be used as toys. And don’t forget, there are some variants for certain characters, so Skylanders combines video games and collectibles all in one nice package. Yes, the older Skylander characters will work in Trap Team, but from what I understand, they won’t be able to unlock the locked areas. Overall I’m very impressed with Skylanders Trap Team. I know it’s a very popular game and it really was a no brainer for Activision to bring the full game to mobile – especially with the advances in graphics and computing power packed into tablets. This was my main reason for picking up, to see just how well it played on my iPad Air and iPad mini Retina. It’s passed with flying colours. 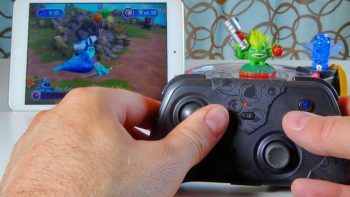 If you’re a Skylanders veteran or rookie, Skylanders Trap Team for mobile is a winner. This has be hopeful that Disney will bring a full version of its Disney Infinity to mobile, especially with Disney Infinity 3.0 scheduled for release later this year. It will feature characters from the Star Wars Universe. Disney says Infinity 3.0 will be available for iOS but it isn’t clear if that will be the full version of the game or just the Sandbox portion of the game. I’d also like to see a full version of the upcoming LEGO Dimensions game on iOS as well. We’ll see what happens, but this is a great start thanks to Activision.